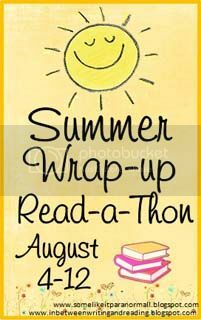 Summer Wrap-Up Read-a-Thon Starts TODAY! If you’d like to join, check out the info here at Some Like It Paranormal. I am looking forward to discovering more books from the many blogs that I follow as well. Maybe I will post that list towards the end of the read-a-thon. Time to write and review for the book I finished last night and to get to the first read-a-thon challenge! Great list, I am participating too..good luck! Cool! I will be checking out all of your posts (well, as I always do!). AWESOME BEANS! I am so excited to see how many people have The Perks of Being a Wallflower on their lists for the week – I just read it and I’m posting a rave review in the morning so I’m rooting for that one! I also have Matched on Mount TBR… no idea where it is, but maybe I should find it for a little summer reading? Hi Ellie – I heard TPoGaW was fab, and I finally got my turn at it from the library. I have seen Matched around a lot, so hopefully, that one’s good, too! Thanks, I’ll come and say howdy. Would love for you to follow me on Twitter and on my blog! I will do the same. Lots of great reads in the pile!!!! I really really want to read Unraveling and Sweet Evil. I enjoyed Matched and hope you do too! Thanks so much for joining us! Happy reading and good luck getting through your goals! For some reason, I am having a hard time getting started on anything. I think it is because it was just the weekend and I had so much to do around the house. I should be able to buckle down and read more now!